Three skirts – my first attempt at a Colette sewing pattern resulted in two beignets – one light denim and one corduroy. I know there will be more of these. A dark denim (just like yours Jane!) and perhaps a lighter linen-style one might be on the cards. 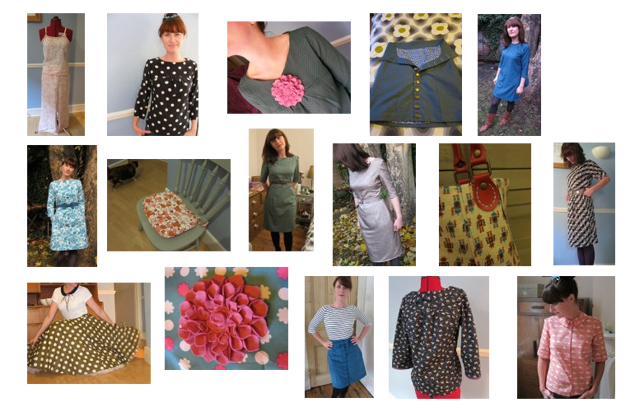 Four tops including one blouse and three copies of an existing Warehouse top, one of which included a self-drafted peter pan collar. Five dresses: Two McCalls 2401s here and here, one Peony, one Simplicity 3835 and one HP 1090. Miscellaneous bits and bobs: A bag, a brooch, a seat cushion, a patchwork quilt, a patchwork cushion, an apron and a pair of pyjamas. The love affair with Colette continues. 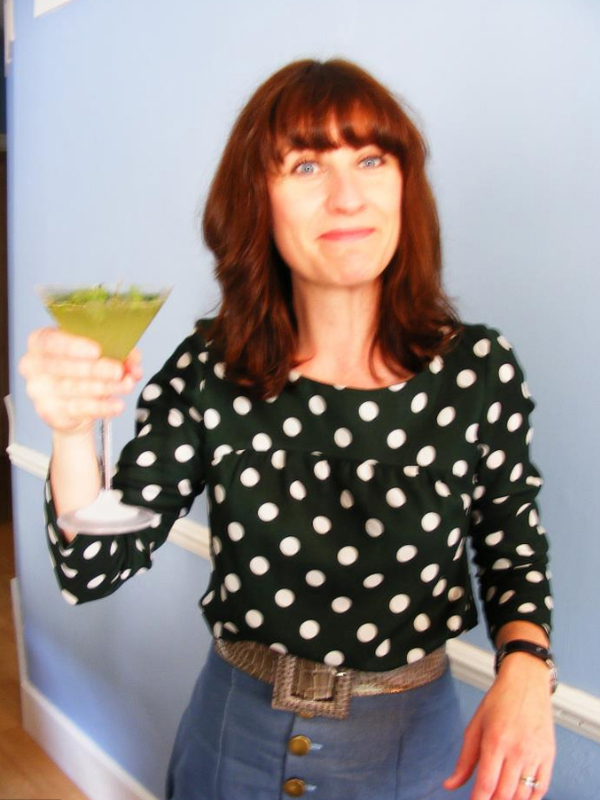 In 2012 I’ll be trying my hand at the Violet, the Ginger and the Negroni, as well as all those patterns from the Colette Sewing Handbook when time allows. Plus I’ll probably revisit the Peony. 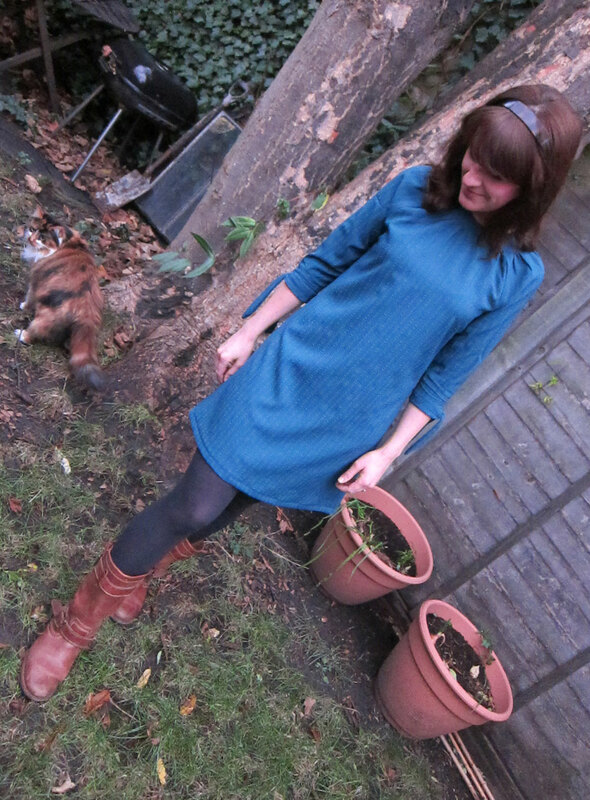 I have yet to make New Look 6000 for Scruffy Badger’s fest but that’s something I’ll turn my attention to between Xmas and New Year – the perfect January dress. I have a bunch of vintage patterns I want to do, including this adorable Simplicity 7845 (middle view and also a Scruffy Badger steal) and this Le-Roy 3133 (view A). I’d like to make some trousers: Specifically a pair with a high waist and a pair of pedal pushers. I’d like to make a frothy romantic summer dress, gauzy and light with chiffon and satin and lace and something else gauzy and light but I don’t know my fabrics well enough to say what it is. I’d like to get to know my fabrics better. I’d like to get to know my body better and perhaps make a sloper or two that’s a perfect fit for me. I’d like to draft an item all by myself using my new sloper. I’d like to get into Pinterest a bit more. I signed up but haven’t really used it so much yet. Much as I love browsing through real-life fabric stores and stalls, I simply haven’t got the time to hoof it round to Walthamstow Market or Goldhawk Road every weekend (oh how I wish I lived near there). And the fabric shops near my place of work are generally pretty expensive (Berwick Street being the closest and very prohibitively priced). So I tend to rely a lot on online shopping. Much of the time I’m pretty pleased with what I receive; the service is generally excellent and the fabric is of good quality. But occasionally online shopping results in a fail. A big fat fail. Not because of any lapse in quality, but because what you see on your monitor doesn’t necessarily tally with what gets delivered. And because the fabric is already cut from the bolt – most places won’t give you a refund. Now that’s not grey. It’s not even ‘silver’ is it? To my eye – that’s just plain off-white. Hmpf. Definitely not suitable for my Minoru jacket. Waaaah. A previous fail was of my own doing. I bought what I thought was a bottle green corduroy and when it arrived I found I had two metres of bottle green cotton canvas. Neither use nor ornament! When I looked back at my order I realised my mistake. I don’t have much luck with corduroys do I? The lesson dear friends? Think twice, read the product description carefully (unlike me) and if in doubt of the colour, ask for swatches before you order. I for one will be doing this in future. A £39 mistake is too expensive to just dismiss. 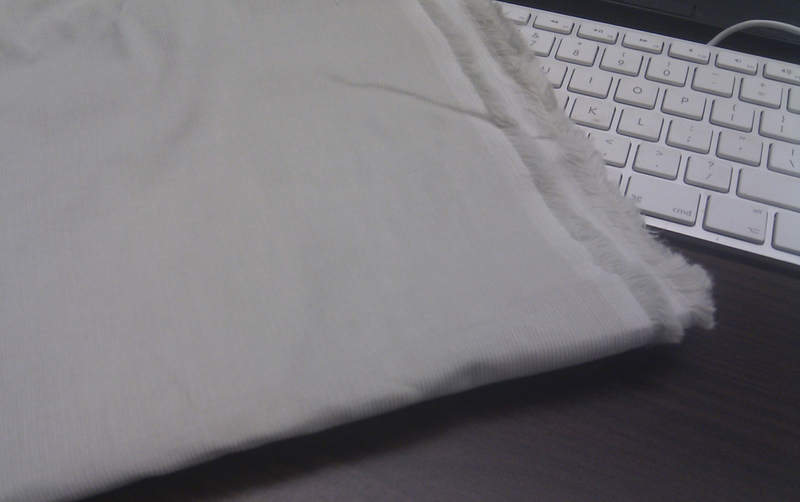 But now onto the positives – what could I use this fabric for? I think this colour next to my skin will just wash me out so I’m thinking judicious use on accessories. What about hot water bottle covers? Or a shoulder bag with a bright neon lining? Or could I use snippets of it as trims and cuffs for future projects? Over to you for ideas! I see my husband is getting a little enthusiastic about the quirky angles. Hmm. Anyhoo, I made this from some uber cheap seersucker cotton from Abakhan fabrics – it was just under £3.50 a metre. And of course it’s one of my favourite colours – teal, so I’m chuffed. The pattern ran quite large so I cut out an 8 according to the finished garment measurements, rather than the 12 recommended for my size and I’m glad I did – there’s plenty of room. The hardest parts were attaching the little ties on the sleeves – lots of steps, each of which you just had to trust. ‘So I have to sew round the edges between the dots? Why? For the love of God why?’ It all made sense in the end. Attaching the collar was tricksy too – the arcs don’t match! One is convex the other is concave (or something). It’s simply not natural, I tell you. Also I’d bought an invisible zip, and the pattern instructions called for a lapped zipper. Now I have no idea if you can do that with an invisible zipper and I wasn’t about to try it out. I ended up winging it a bit at the back but it’s alright. I’d definitely make this again, but I’d work a bit on gathering more at the front than at the sleeves and I’d like a version without the ties (so I can pop a cardy on over the top). I’d also like to find a good walk through online first – anyone know of one? By the way – how much of a show-off is our Gracie? I can barely take a pic without her sashaying into view with her tail in the air. Proper little madam. Hallo peeps – how is your run up to Christmas going? Is it the calm before the storm, are you in a whirlwind of frenetic sewing and buying and cooking, or have you finished all your preparations to the festive season and popped your slippered feet up for a well-deserved rest? Me? I’m somewhere in between. I’m pretty sure I’ve bought everything I need to with the exception of one present. The turkey and the sausage meat is ordered and the wine is in. So it’s time for some bonus sewing! Which is what I’m doing! Over the weekend I did a bit of stash-busting. I have so many fat quarters (oi! oi! stop that sniggering at the back) I don’t know what to do with them and quite a lot of leftover fabric from other home-type projects like cushions etc. 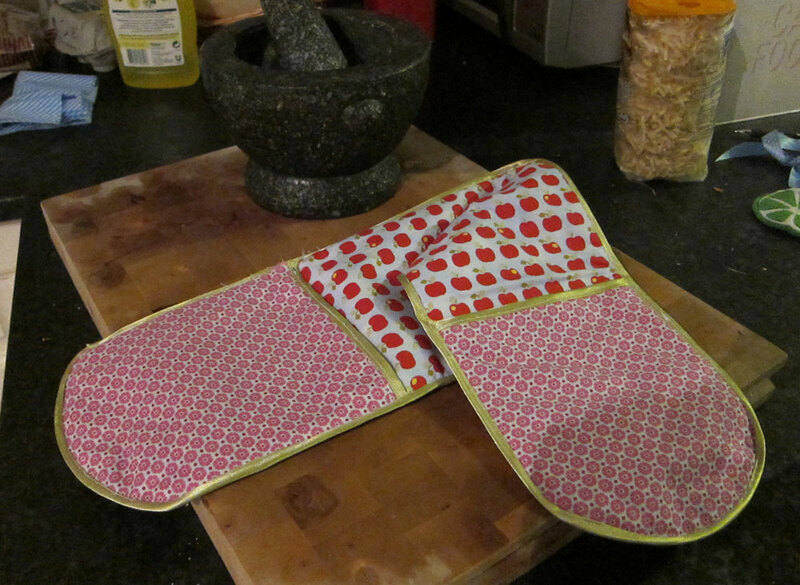 This tutorial for making a double oven glove is brilliant. It’s so incredibly easy. I bought a couple of metres of Insul Bright filler from Doughty’s (think it was Handmade Jane that provided the link in one of her blog posts) and got to work. It only took a couple of hours – and here it is. There’s just one thing stopping me from giving this away as a gift. My bias binding was a little slim which meant there’s a teeny bit where it’s not quite pulled under one of the pouches. Try as I might to unpick and redo this bit it just kept slipping free so I’m going to fix it with a few hand stitches and keep it for myself. 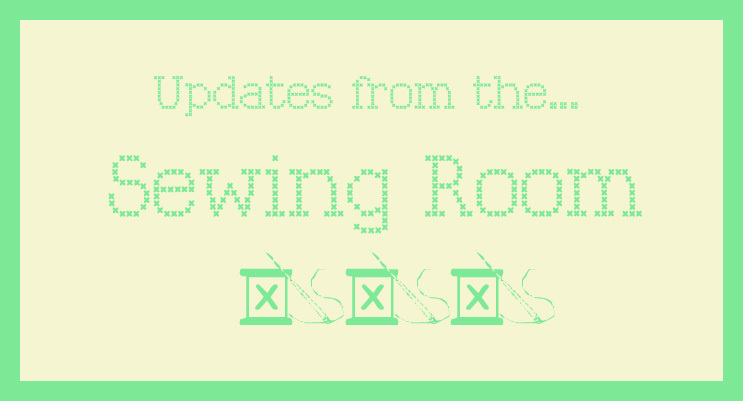 I’ve ordered a bunch of wider bias binding so once that’s arrived I’ll get on with knocking out a few more. 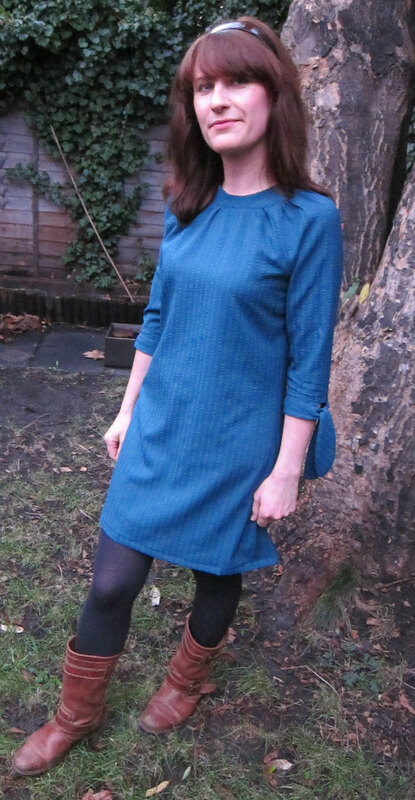 I’ve cut out my pieces for Simplicity 3835 (mini dress view) in a lovely seersucker teal cotton. I’m quite excited about this one. I’m hoping it will be a nice simple project to get on with while I wait (and wait and wait…) for New Look 6000 to land on my doormat. Why won’t the internet elves hurry up? You’d think they had something better to be getting on with. Hmph. Want to join Scruffy Badger’s sewalong. Although it’s great seeing posts as they come in as I’m getting loads of tips on underlining and fitting before I even start. I’m on the lookout for fabric now for the Minoru jacket sewalong starting in January. I’m thinking a soft grey corduroy outer shell with a teal/polka dot lining. What do you think? Any good tips for quality (but affordable) corduroy? I’ve just read that Suzy is doing the same sewalong, and I’m pretty certain Karen is which is ace. Anyone else? Finally I have a UFO lurking in my sewing room. The Trudy-tribute coat is gathering dust motes at the moment. I’m not quite sure if I can return to it yet. I’m not quite sure that it can still be termed the Trudy-tribute coat either to be honest – I think it will be very different. But that’s cool – it could wait until spring as it would be too light to wear over winter anyway. So that’s me. What about you? Are you itching to get on with a project pour toi and cursing all those evil lifelong friends and family for making you do selfless sewing? Or is it actually quite nice to have a change? My sister has three dogs. Yes – that’s three dogs. 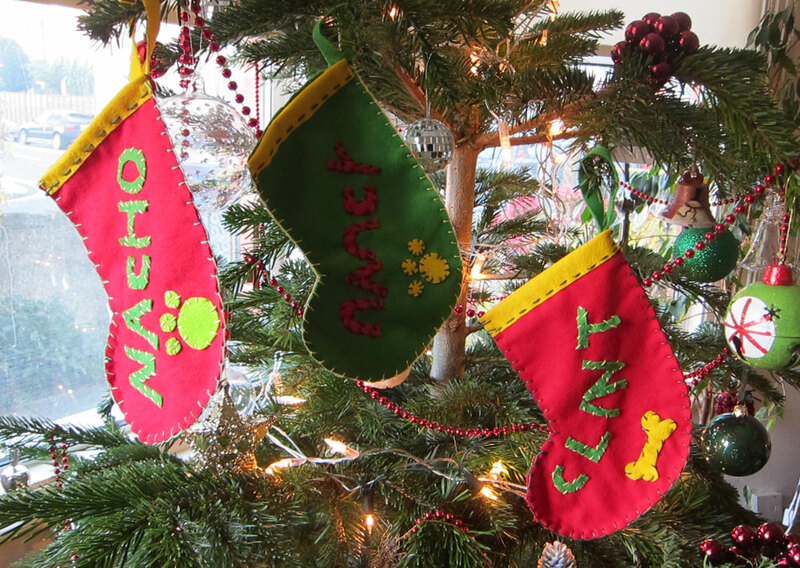 They’re called Nancy, Clint and Nacho and apparently they all wanted a Christmas stocking with a bone in it come Christmas morning. So my sister called me up and asked me would I be prepared to make each of them a little stocking, just big enough to fit a bone in. And more fool me, I said yes. Actually this only took an hour or so per stocking so it was a quick and fun little project to do. 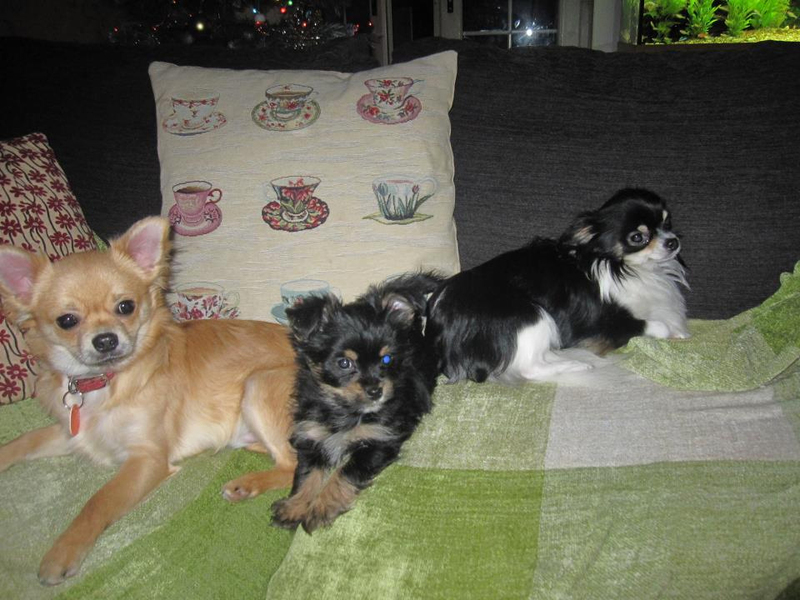 And who could refuse these little faces? 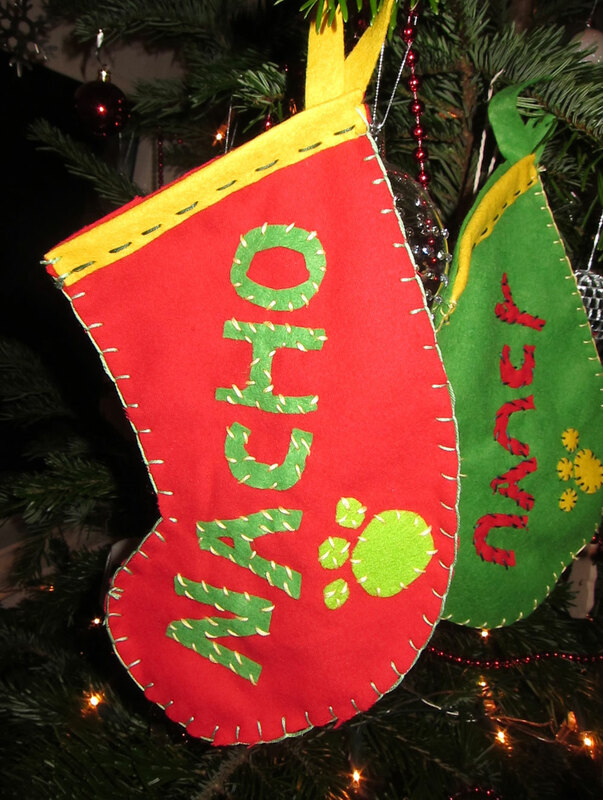 So here you are Nancy, Clint and Nacho – these are for you! It’s been a busy week or so round our way: my husband’s mum and stepdad came to visit us before flitting off to beautiful Thailand for four months of beach-lounging, Thai cookery and general lazing about (very much deserved of course but we can all allow a little envy!). Then it was the work Christmas party on Thursday to which I wore my very own handmade dress for the second time in a month – yay! Having the in-laws over meant that I could give them their handmade Christmas presents, which I’ve been itching to share but haven’t been able to for obvious reasons. I really wanted to make them something but had to think carefully about what I could make that they could take away with them. 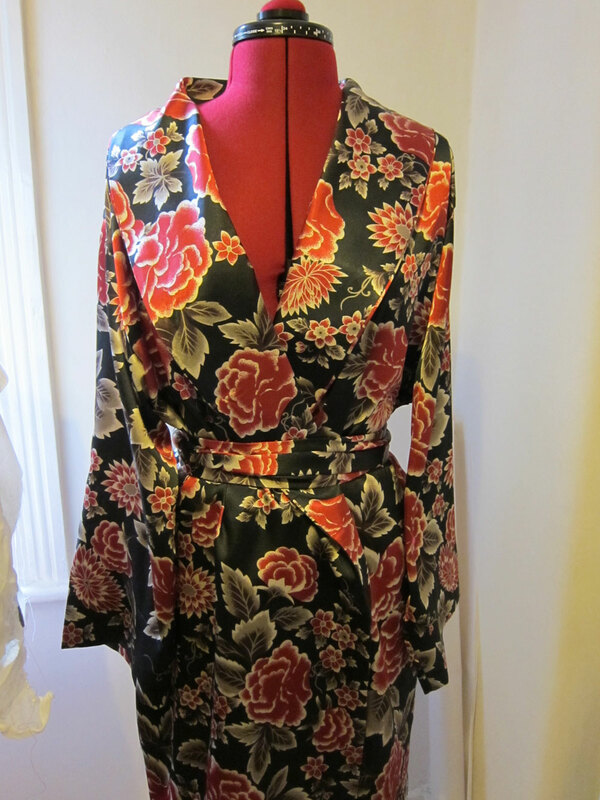 And then I thought – dressing gowns! Of course! Nothing better than relaxing on your own sun-drenched terrace, sipping iced lemon tea and flicking lazily through a paperback… in a custom-made dressing gown. I hotfooted it to Walthamstow market for the fabric as I knew I could get some good deals, have lots of choice and still not break the budget. My pattern (Butterick B5537) called for SIX METRES of fabric which seemed ridiculous. In the event I got four metres for each gown as I wanted to reduce the length to something more summery anyway. It took just less than three metres of fabric for each in the end. For Ann’s I chose a beautiful satin that just drapes gorgeously. It was a slippery little bugger to sew though. I gave up on adding a pocket in the end because it slid about like a drunk little stitchandwitter weaving her way home from a xmas works do. My pinking shears did not like this fabric one little bit. 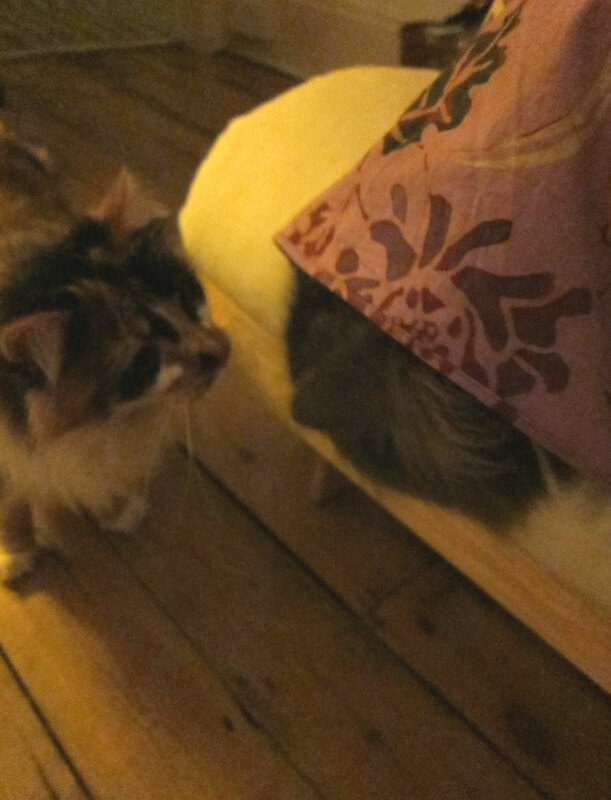 They chewed at it, rather than slicing through it, which means although the dressing gown is lovely and neat on the outside, it’s a different story with the seam finishes on the inside. But another lesson learnt nonetheless. Dale is not a slinky slippery silky fabric sort, thank goodness. For him I chose a brushed plaid cotton, which may just be a touch too warm for where he’s going but he said he going to wear it anyway, bless him. Much easier to sew and since it was the second version, much quicker too. 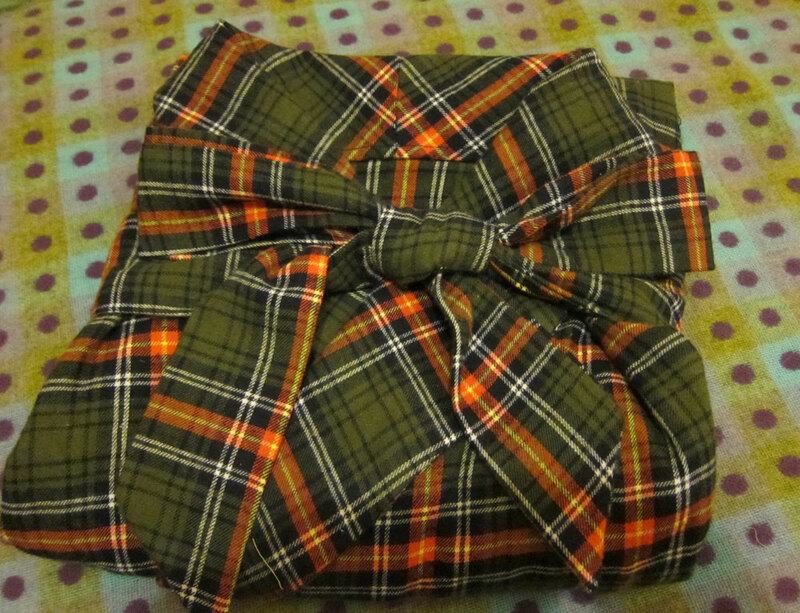 I didn’t get a pic of Dale’s on the dummy but here it is neatly folded and ready to wrap! This is a pretty easy project if you want to try it, although if (like me) you’re used to the excellent instructions that come with Colette patterns then trying to work your way through the illustrations and slightly cryptic details may be frustrating at first. I still have so much to learn when it comes to understanding regular patterns. 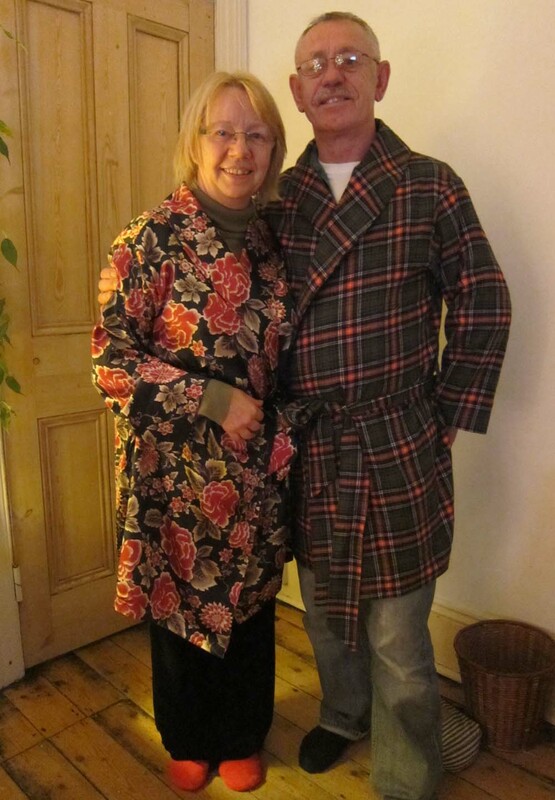 But never mind all that – here’s a picture of Ann and Dale in all their handmade finery! Well, do you promise not to laugh? Unlike my husband who dissolved into a fit of giggles last night when I bounded in on him in tights and vest top looking like a demented Marcel Marceau with a digital camera? Or who literally laughed until he cried when I was sorting through the images on the laptop? You sure? Here we are (stop sniggering at the back). Yeah so NOW it looks normal! Hahhaha. Bonkers. So not really sure what to make of this, or how to read it. Am I right in saying I have a high waist, or is it a long crotch? I think the pear shape goes without saying. 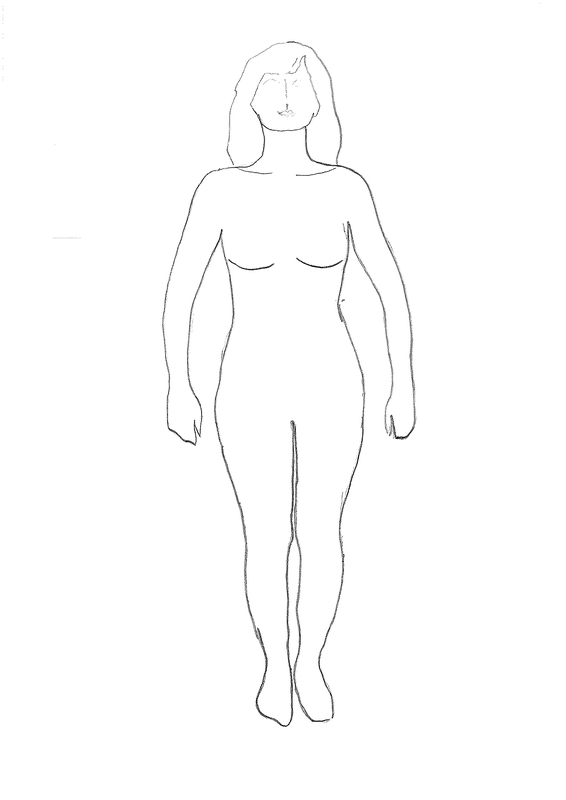 Looking at this silhouette I’d guess that this gal would suit curved/tightish shaped dresses (a bit like McCalls 2401) or straightish/A-line dresses to the knee, rather than full/long skirts. 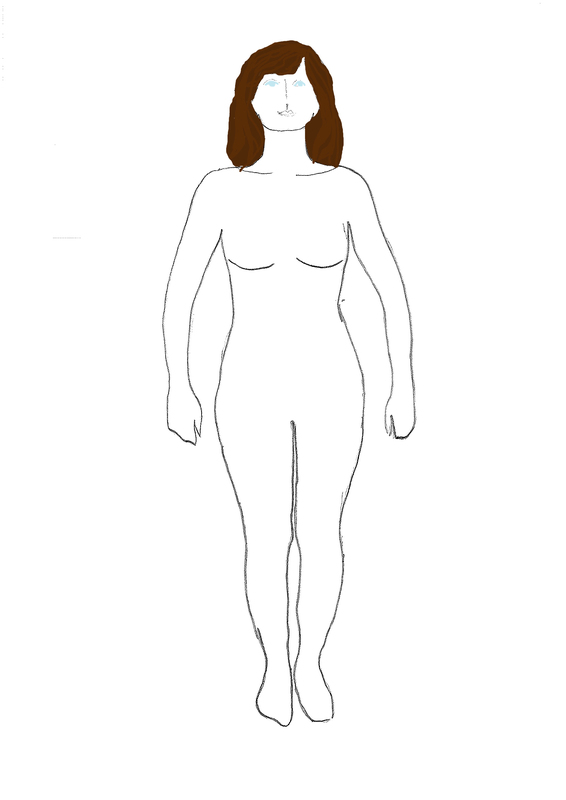 Rounded shoulders maybe. I like that my collar bones stand out a bit – might be nice to find a neckline that shows them off a bit more. Not much going on up top. That’s cool. I came to terms with that when I was 14 or so. I’m very tempted now to start playing paper dress-up dolls again! I’ve got a bunch of these printed out now so I’ll start playing around with them at home. The Colette Sewing Handbook recommends using them for inspiration, pasting swatches of fabric on them, sketching shapes over the body etc. It’s going to be a lot of fun in any case! P.S. 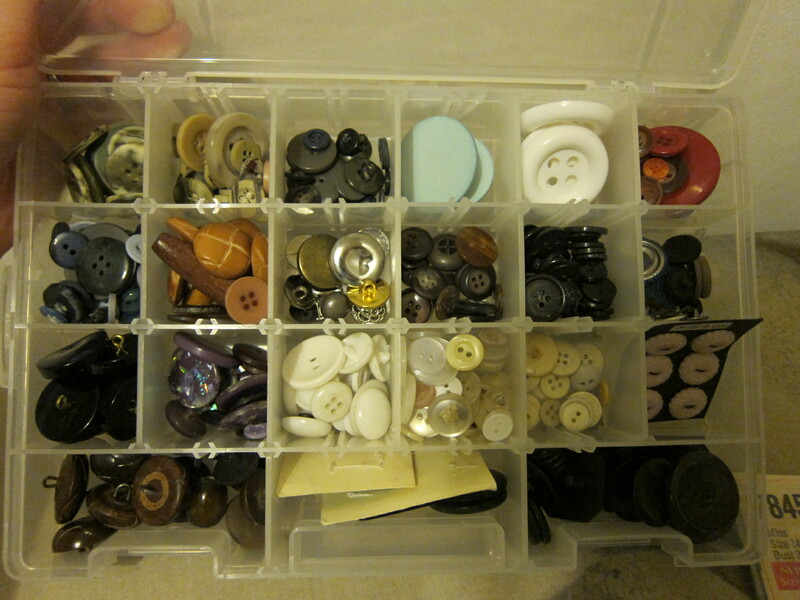 Heres my colour-coded button box… for all you neat freaks out there.